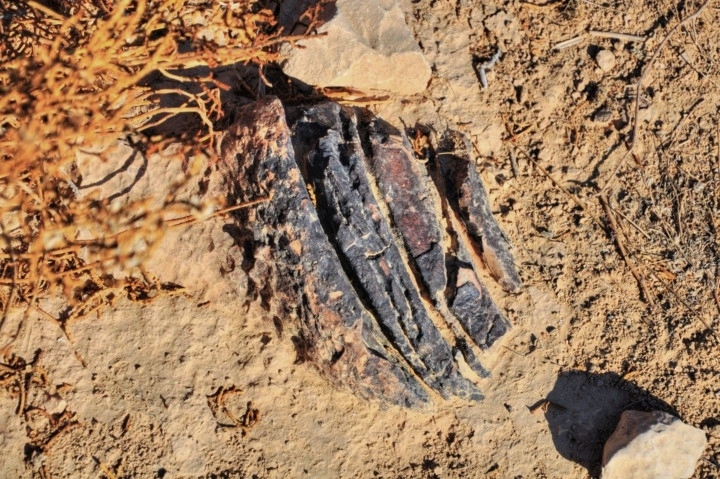 A desert Oasis named after Moses and Aaron. 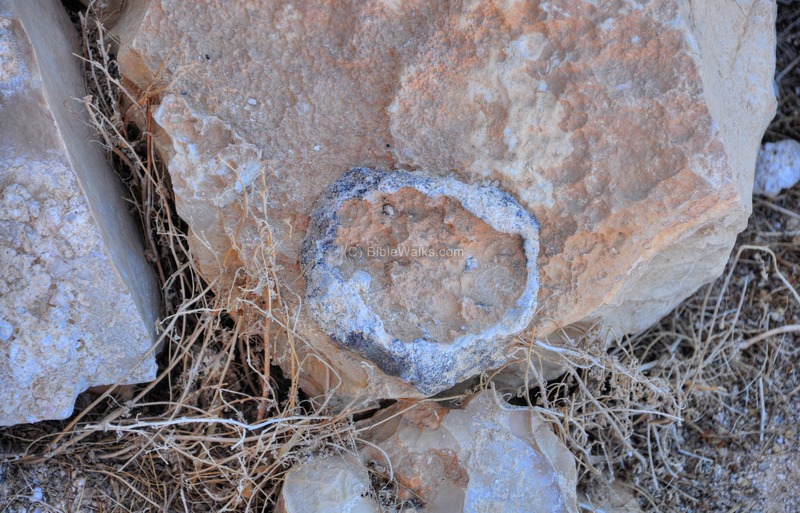 Remains from the Bronze and Iron Age periods, Nabatean period, and Ottoman railway. Deuteronomy 10:6: " And the children of Israel took their journey from Beeroth of the children of Jaakan". 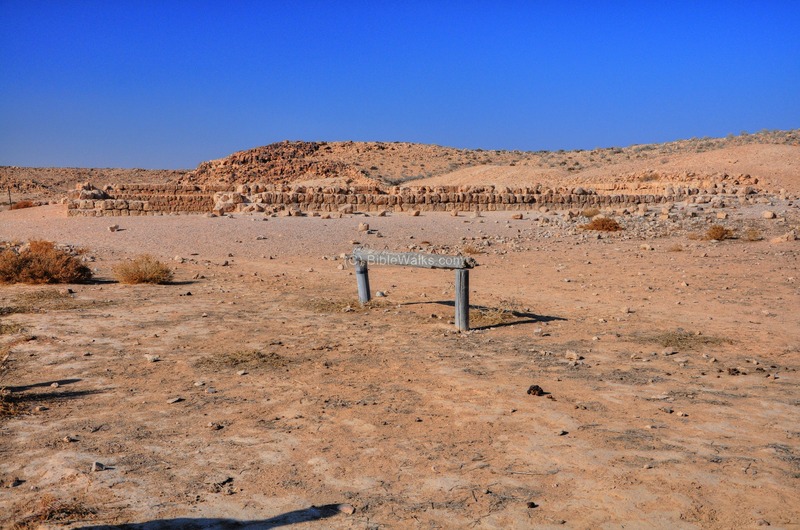 An oasis south of Nitzana, where its two wells (named after Moses and Aaron) gave the name of the place as "two wells". Remains around the site include traces of prehistoric structures, Iron age and Persian period fortresses, Nabatean desert farming and water systems, and an Ottoman railway. The site is located 10km south of Nitzana, 17km north-north-east of Kadesh-Barnea, 62km southwest of BeerSheba. 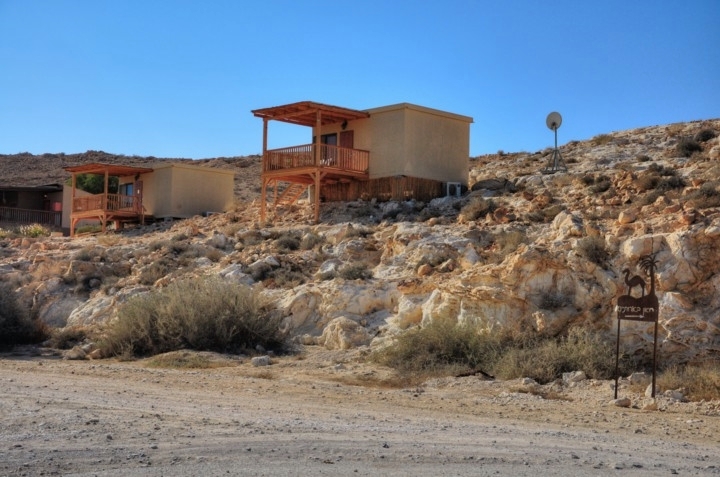 The community of Ezuz ("strong") is located on the hill east of the oasis, at a height of 234m. The aerial map shows the area, indicating the major sites. You can press on the yellow squares to jump down into the relevant section. 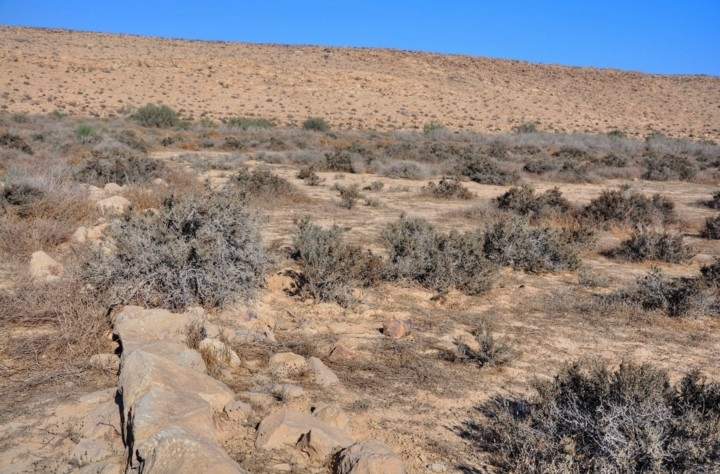 The oasis, with a year round water supply, attracted settlers from early times. 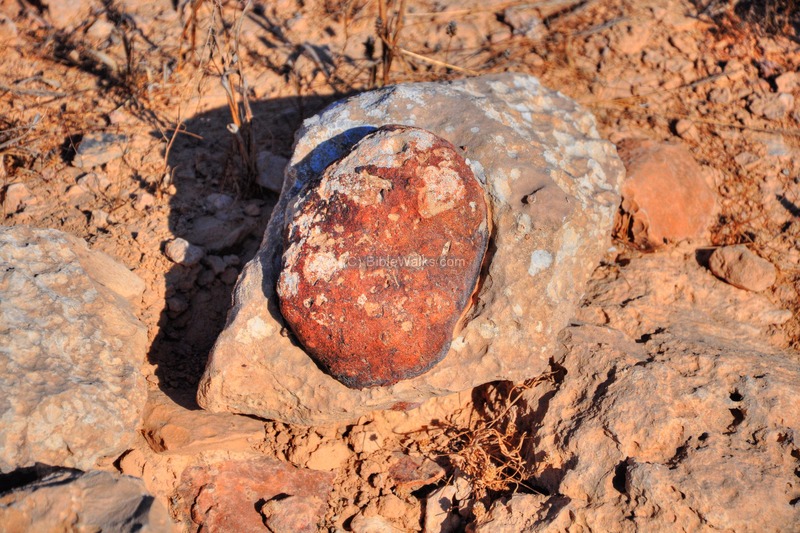 Flintstone tools are scattered in the area around the site, evidence of a prehistoric settlement dated to the Middle and Upper Paleolithic periods (80,000 BC through 16,000 BC). 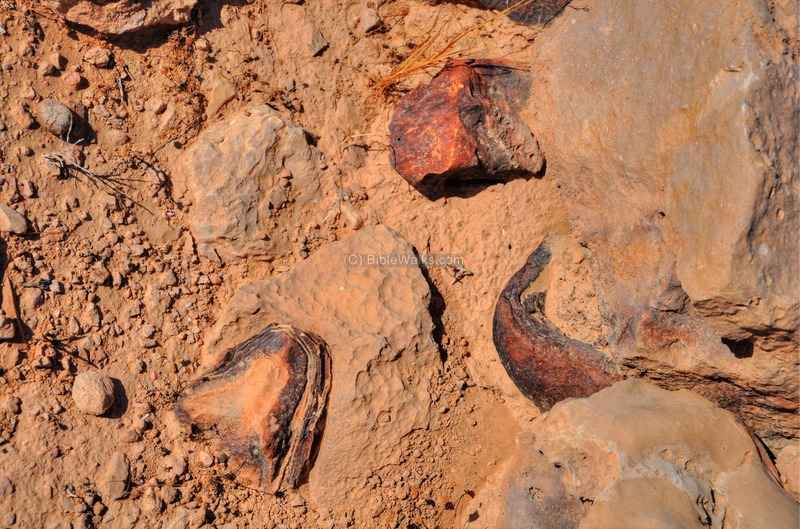 The site was was also settled during the Early and middle Bronze periods (31500-1550 BC). According to the archaeological survey, remains of structures were identified on the eastern and western hills. North-East to South - Darb el-Shur ( "The way to Shur" - Beersheba to Kadesh-Barnea). This route is based on the Biblical name, described in the story of Hagar and Sara (Genesis 16, 7): "And the angel of the LORD found her by a fountain of water in the wilderness, by the fountain in the way to Shur.". It is indicated as a dashed dark-grey line on the map. South-East to North-west - Darb el-Ghaza ( Aqaba/Eilat to Gaza). The southern side of this route is indicated as a light grey dashed line. Kadesh Barnea, a large oasis located 17km to the south of Be'erotayim, was the southern border of the land of Canaan. 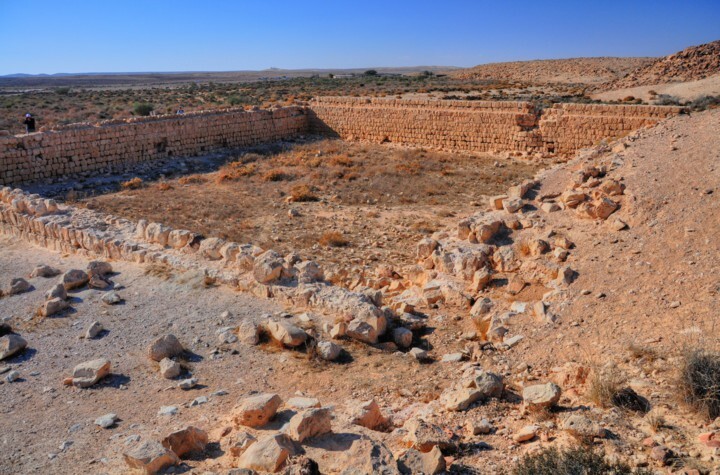 Kadesh, blessed with many wells, was one of the major stations on the way from Canaan to Egypt. 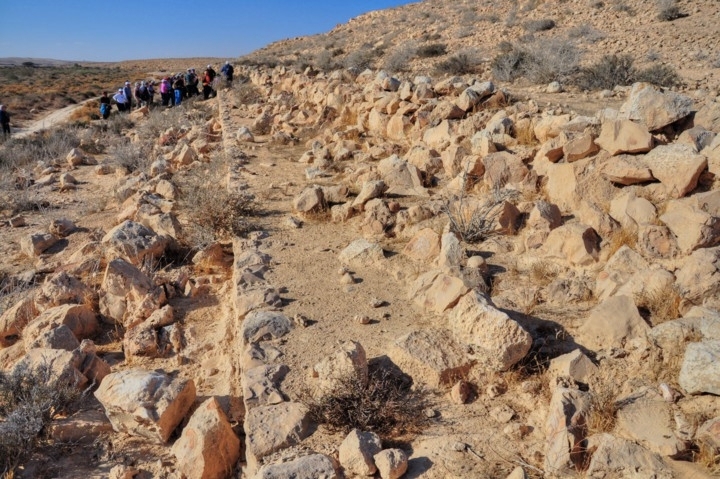 It was a site where Abraham dewlt (Genesis 20, 1): "And Abraham journeyed from thence toward the south country, and dwelled between Kadesh and Shur, and sojourned in Gerar". Moses, Aaron and the Israelites passed through Kadesh and stayed there for a long time after escaping the Egyptian exile. According to the Bible (Deuteronomy 1 46): "So ye abode in Kadesh many days, according unto the days that ye abode there". In Kadesh, Moses sent forth the 12 spies to prepare their entry back to Canaan (Numbers 13 17): "And Moses sent them to spy out the land of Canaan". The return of the spies is illustrated here on the right. 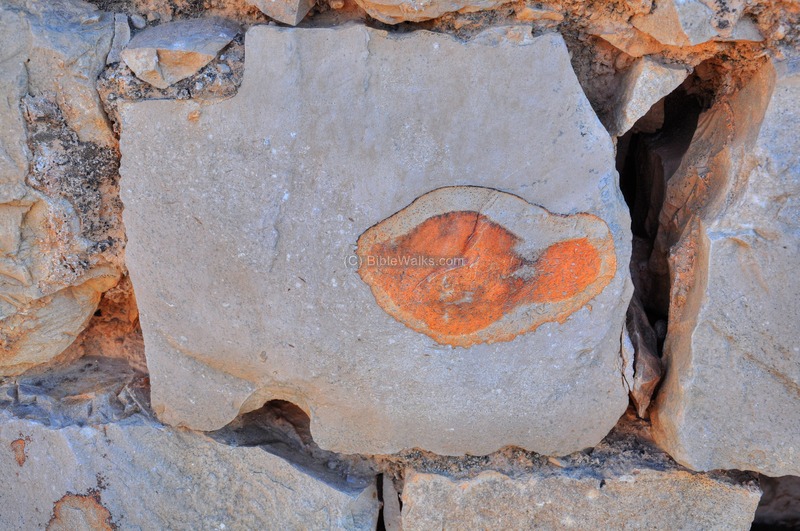 The spies probably passed through Be'erotayim. 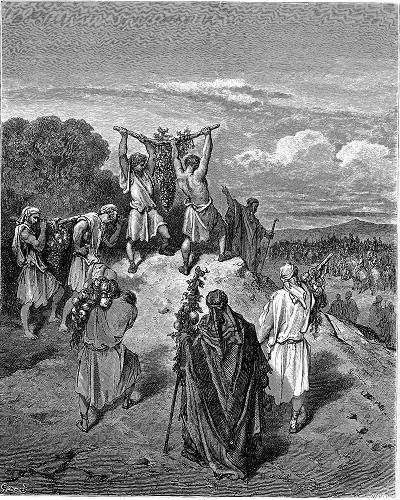 Following the path of the spies, the Israelites attempted to conquer Canaan from Kadesh, but this first attempt failed after the Canaanites blocked their way (Numbers 21 1): "And when king Arad the Canaanite, which dwelt in the south, heard tell that Israel came by the way of the spies; then he fought against Israel, and took some of them prisoners". As a result of this Canaanite resistance, the conquest plan changed, and the next attempt was conducted years later through Edom on the east. 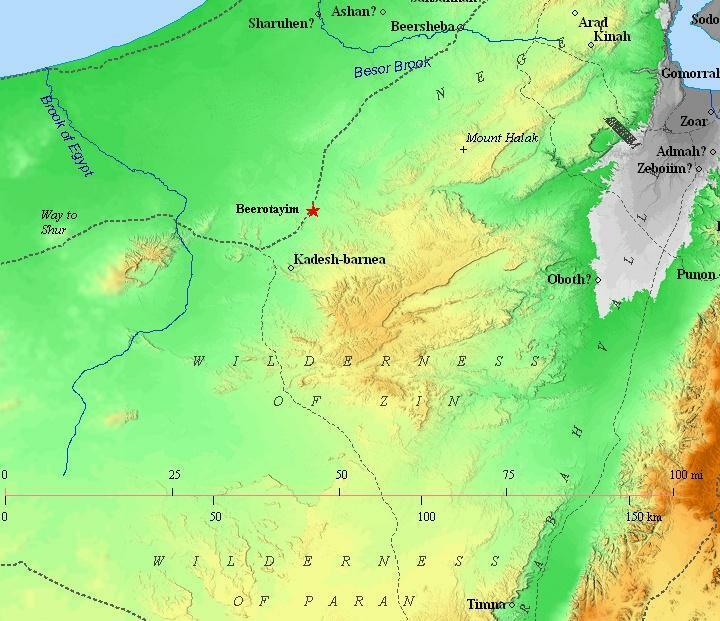 After the Israelite conquest of Canaan, the area around Kadesh and Be'erotayim was within the inheritance of the tribe of Judah. A fortress was located on the western hill. 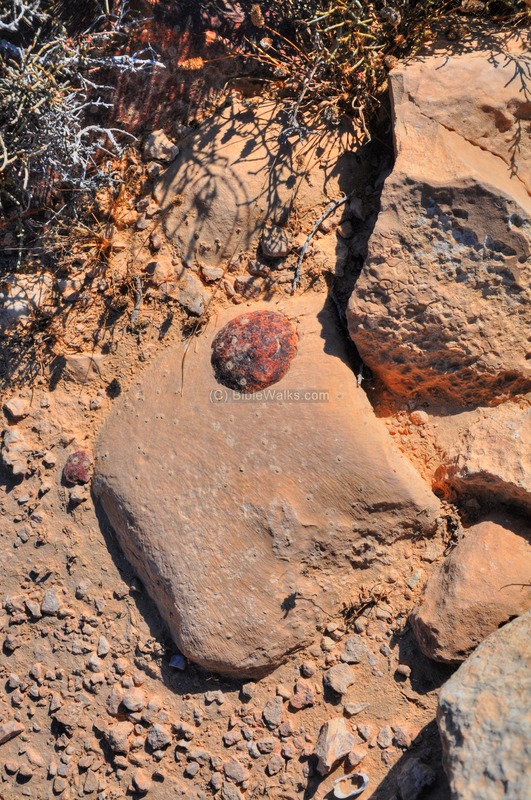 It is dated to the Iron Age IIa period (1000-925BC). This is a rectangular structure with a tower and residential rooms. This period is about the time of King David, who enlarged the Kingdom beyond Kadesh. 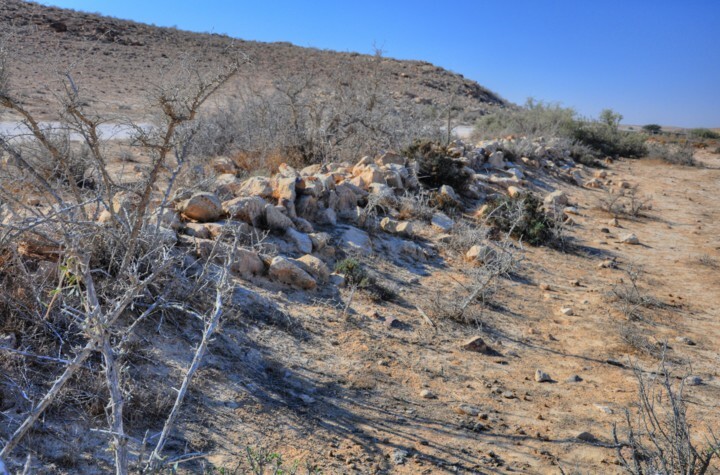 The southern border reached "the brook of Egypt" - 25km to the west of Be'erotayim. In general, there was an unprecedented growth in the Negev area during the Iron age. The Bible writes about King Uzziah (2 Chronicles 26 10): "Also he built towers in the desert, and digged many wells: for he had much cattle, both in the low country, and in the plains". 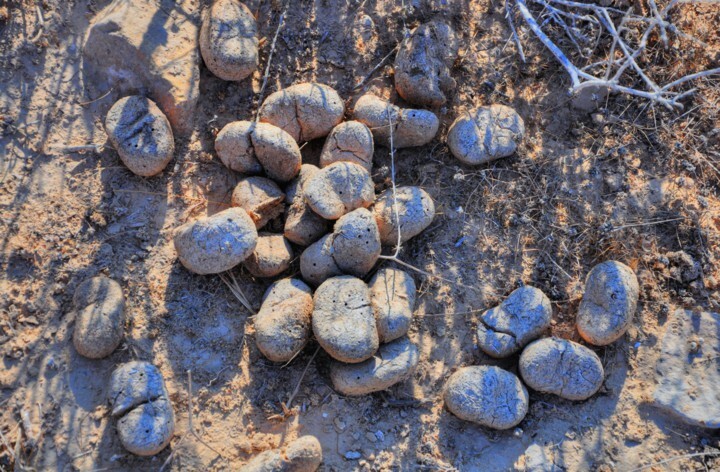 The ancient desert farming techniques were probably invented during those times, and later perfected by the Nabateans. On the western hill are remains of a fortress dated to the Persian period (539-332BC). The Ottomans attempted to conquer the Suez canal from the British during WW1 (1914-1918). They supported this mission by laying out an extension to the western Hejaz railway section from Damascus to Afula, which was built in the years 1900-1908. 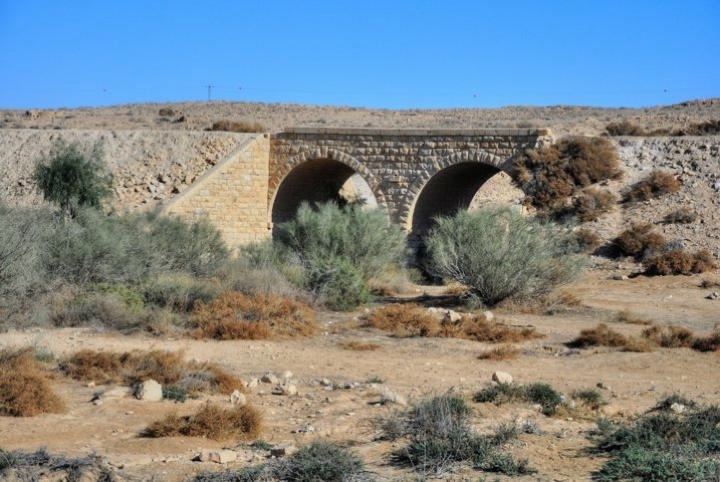 This railway was extended to BeerSheba in 1915 and reached Nitzana and Be'erotayim in 1916, then was completed in Kuseima (Biblical Atzmon, 10km west of Kadesh). The design and management of the entire Hejaz railway project was commissioned to the German engineer Heinrich August Meisner. In Be'erotayim was a water refilling station for the railway. 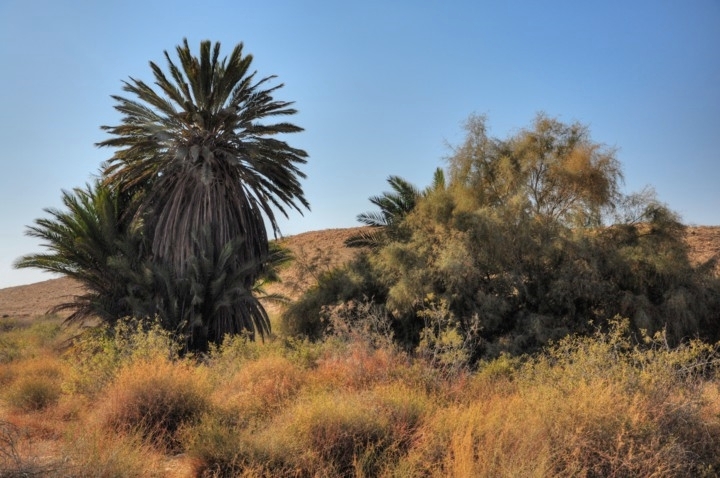 In 1956 a Kibbutz was established here on the border with Egypt, but abandoned in 1965. In 1985 a communal settlement was reestablished here. The park of Be'erotayim is open free to the public, and come here for a short visit or overnight camping. The oasis of Be'erotayim is based on the abundance of water at this location. Two wells were dug here in ancient times, and are named after Moses and Aaron. On the eastern hill are the houses of the modern communal settlement of Ezuz. 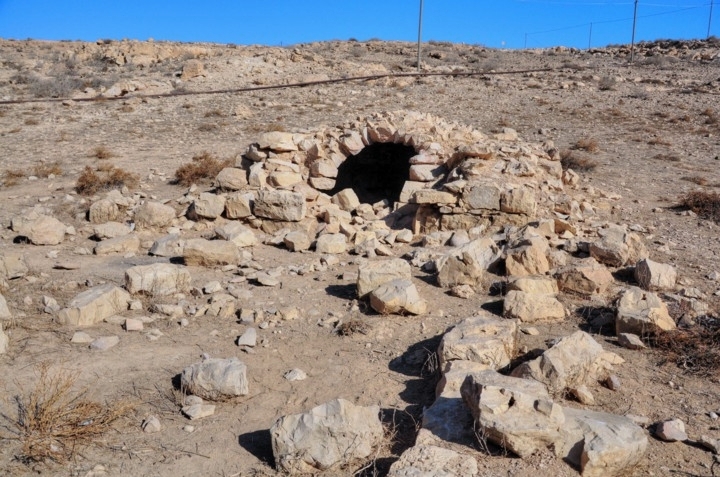 On the hillside are several installations such as this old Turkish covered oven, where Bedouin women used to make bread for the Turkish soldiers stationed here during WW1. (Thanks for correction by Dr. Tali Erickson-Gini, who heard this from Alon Galilli). 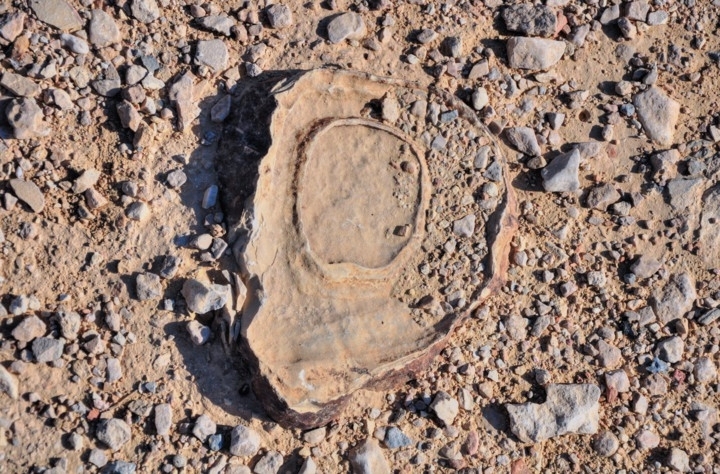 "Aaron's well" is located on the south side, while "Moses' well" is on the north side of the oasis. 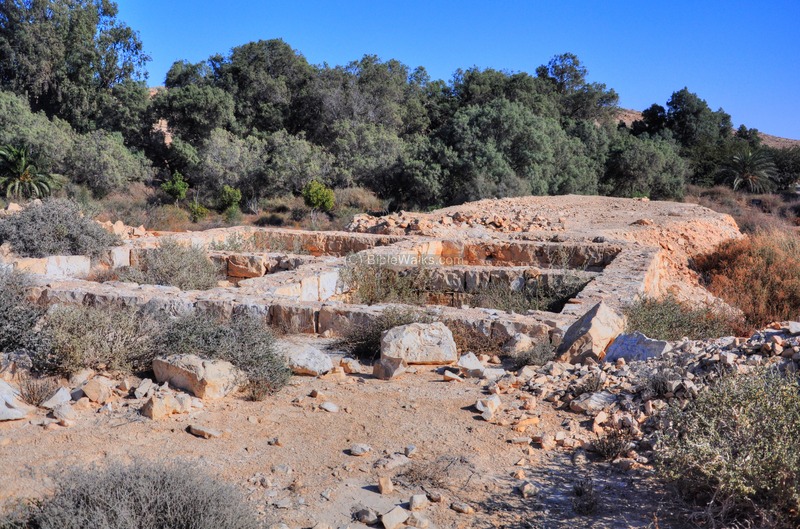 The former well filled up a reservoir, seen below, which was used to supply water for the Ottoman trains that passed at this location on the way south. The impressive trees (Eshel, Tamarix aphylla) were planted in 1916 during the construction of the Ottoman railway and are 12m high. On the foothills of the western hill are houses of one of the local desert guest houses. 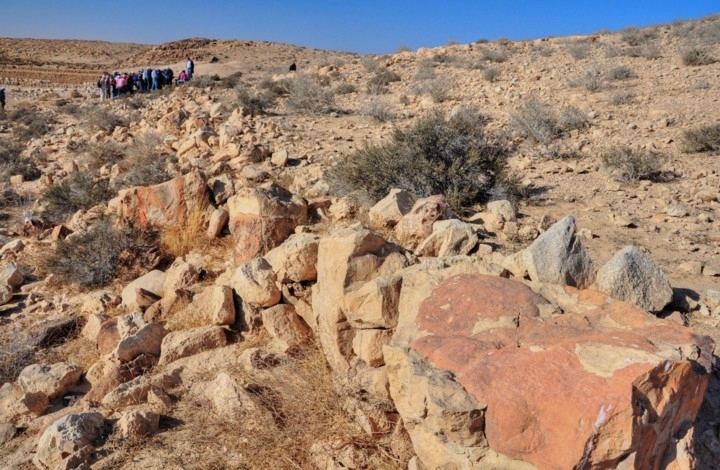 The community of Ezuz has several of guest houses ("zimmer"), including the unique desert guest house of Khan Be'erotayim (Ecotourism), located in the Be'erotayim stream (200m west of the Nabatean pool). It offers a hospitality mud house, meals based on local made materials, desert tours, camel rides and nature walks. 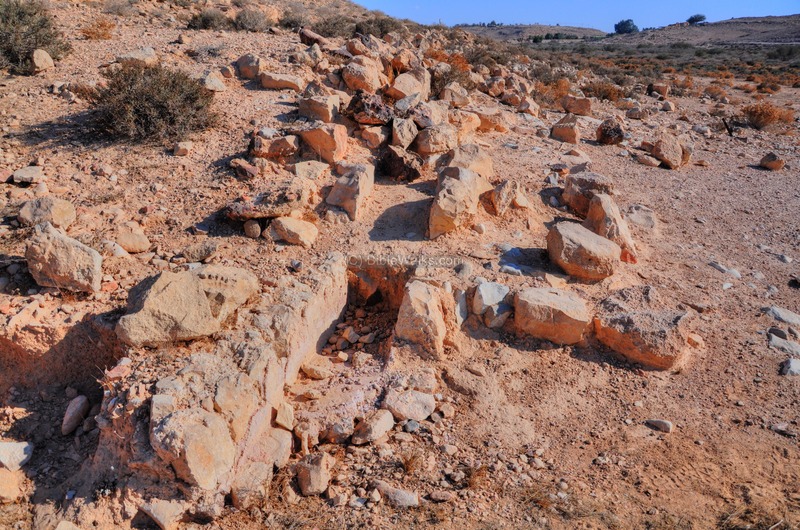 A number of ruined structures are scattered around, such as the one below which is located west of the Turkish railway bridge. 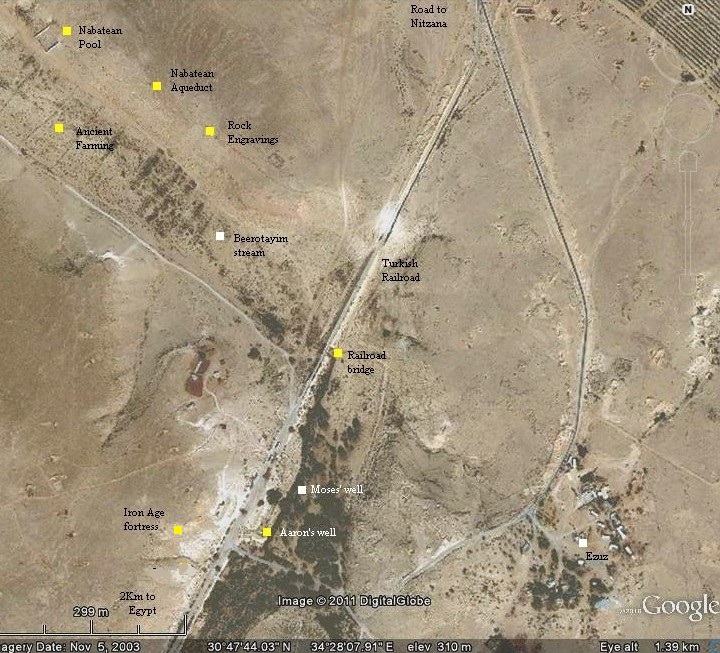 The Ottomans built this railway in 1916, connecting Kuseima, south of Be'erotayim, to the north (Damascus and beyond). A railway bridge over the Be'erotayim brook remained from that line. Along the stretch of the dry Be'erotayim stream are traces of the ancient Nabatean desert farming. 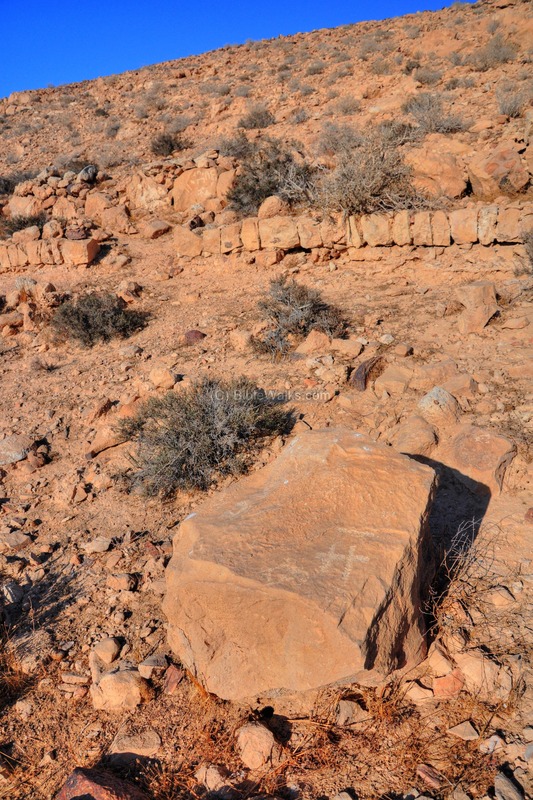 During the Roman and Byzantine periods the Nabateans mastered the knowledge of collecting scarce desert water and using it for farming. They supplied fresh vegetables and fruits to the Nabatean cities, such as the nearby Nitzana, and to the army garrison stationed along the frontier. 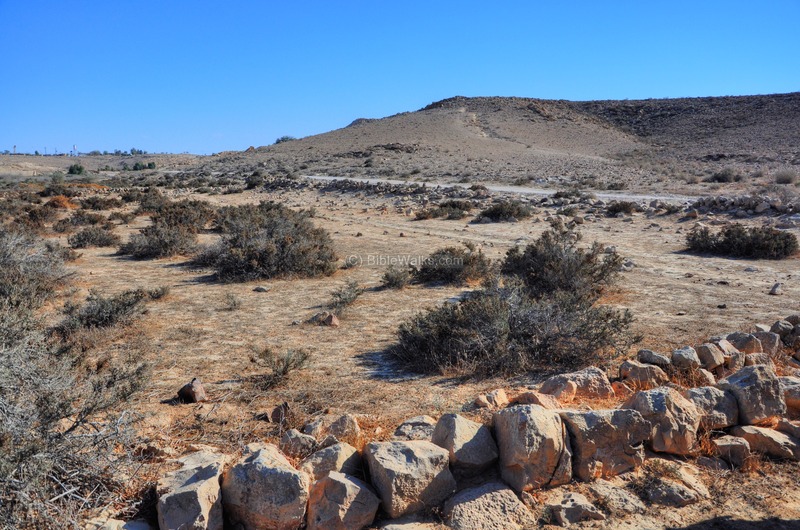 This desert farming started in the end of the 1st C AD and lasted until the 8th C.
The Nabateans built their farm lands along the narrow valleys (Wadis). The idea behind this was to collect the scarce rain water (only 200-300mm annual rainfall), and multiplying it by collecting the runoff into a smaller area where they would plant the crops. 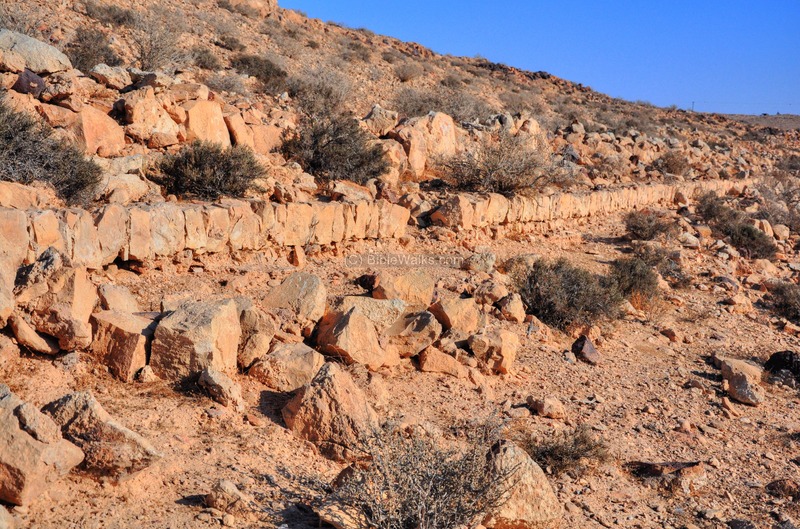 These ancient farmers constructed stone walls, such as the one seen below, thus creating a series of dry lake sections. During the winter time, the rain water was collected from the hills around the farm land, and the water flooded these lakes, thus watering the crops. As seen in the aerial view of the stream, at the top of this web page, the size of each farming section was roughly 250m in width (the size of the valley) by 120m (the distance between each separation wall). The total farming area of each section is 3 dunams (0.3 hectares). The researchers found that the ratio of the drainage basin for each such farming module was roughly 25 times larger, so each such section was watered by a drainage basin area of 75 dunams (7.5 hectares). 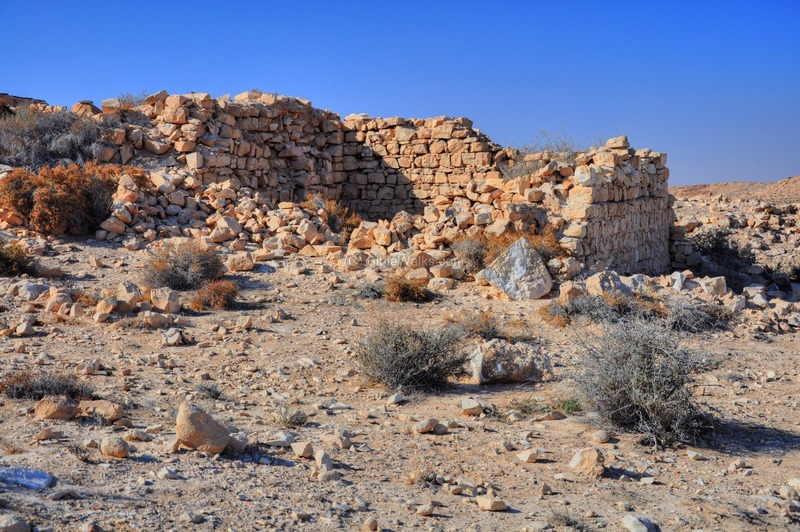 The Nabateans covered about 40,000-50,000 dunams (35,000 hectares) of farming area in the Negev area, out of a total of 2 million dunams (or, 2.5%). Most of the Negev farming was based on dryland farming ("Baal") based on rainfall, while a minority of the agriculture was based on irrigated farming ("Shalkhin"). 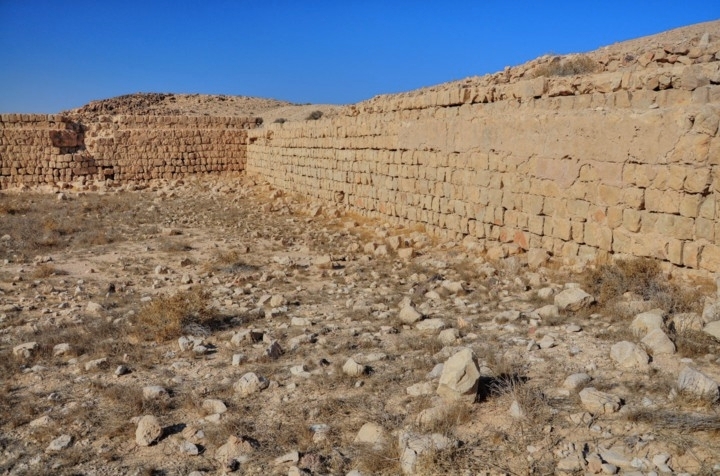 A large pool, dated to the Byzantine period, is located on the northern side of Be'erotayim (Ezuz) stream, about 800m north west of the railway bridge. The Nabatean pool measures 28m by 41m, with a depth of 3m. The pool is fed by an aqueduct, which is seen in the following picture. The north and western walls of the pool can be seen in the next photograph. 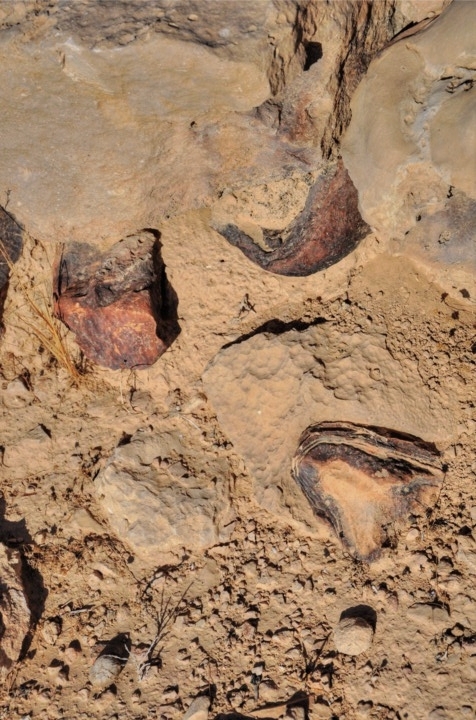 The pool may have been covered with a wooden frame and a roof in order to reduce the evaporation of its water, but that has not been confirmed. Then the water was transported from the reservoir to the fields along channels. One of these water channels is seen in the following photograph. The main aqueduct is seen stretching from right to left, and this water channel tapped off the aqueduct. The water supply supplemented the rain water which filled up the farming sections during the winter time. 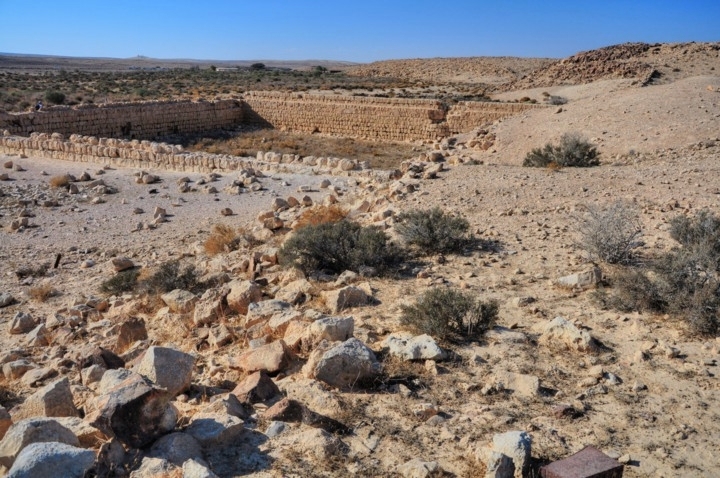 Sections of the upper aqueduct, leading water into the pool, is seen along the north side of the Wadi, between the Nabatean pool and the two wells. A cross section of the aqueduct can be seen below. 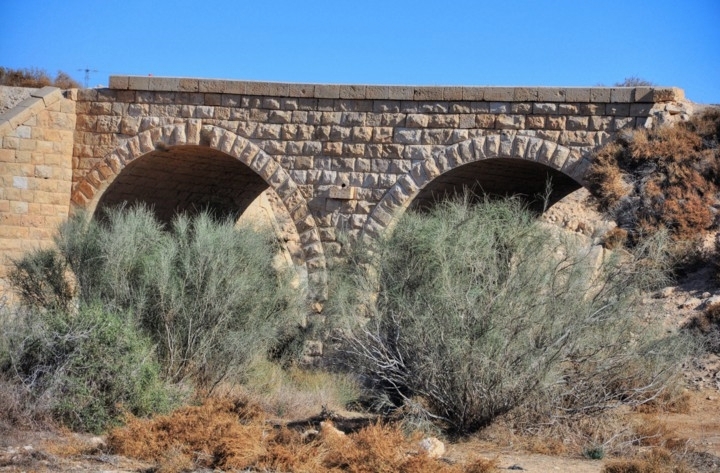 The total length of the aqueduct is 1400m. It collected rain water from the hills around the site, feeding into the pool, and then used to supply water to the fields. Nearby, two Christian names are inscribed on dark, sun baked rocks. 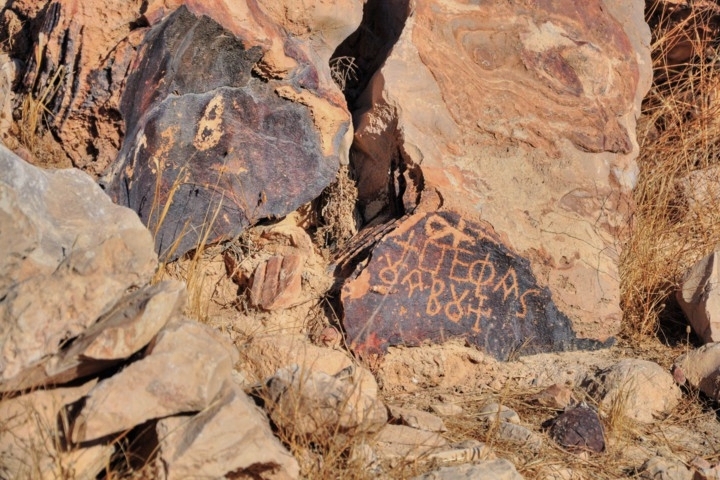 The first, in the following photo, has two crosses on both sides of the Greek inscription, and bears the name "Stephanus son of Wabus". Another Christian engraving is of "Yosef son of Almz". 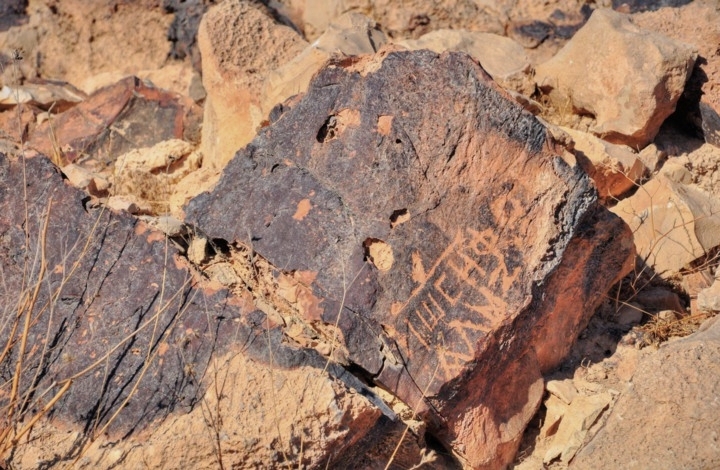 A larger number of rock engravings, including inscriptions and drawings, can be seen near the crossing of the streams Nahal Beerotayim and Nahal Takif, about 2km west of the Nabatean pool. The last stones are actually ... camel droppings. 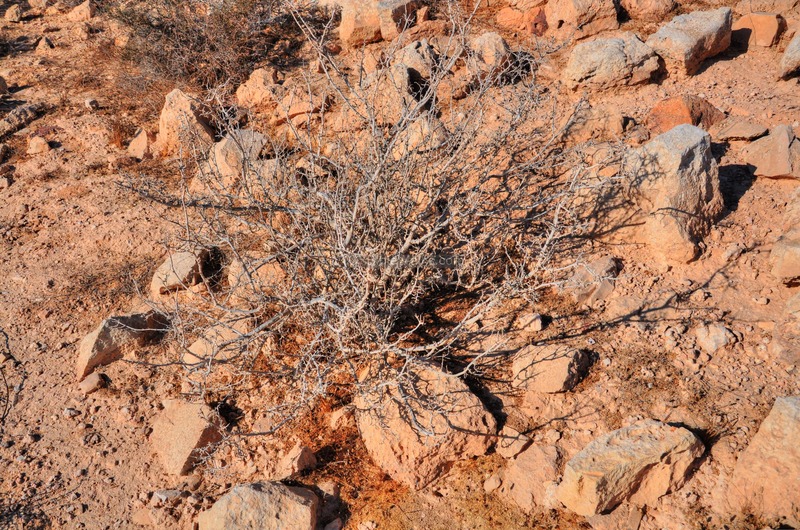 The desert is very dry here, with about 200mm annual raindrop. 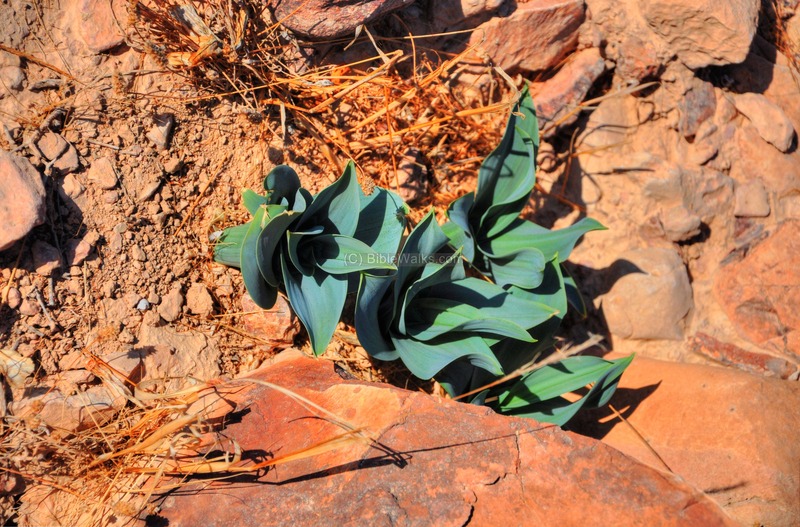 Although it is mid winter (January), there are no signs of any rain. 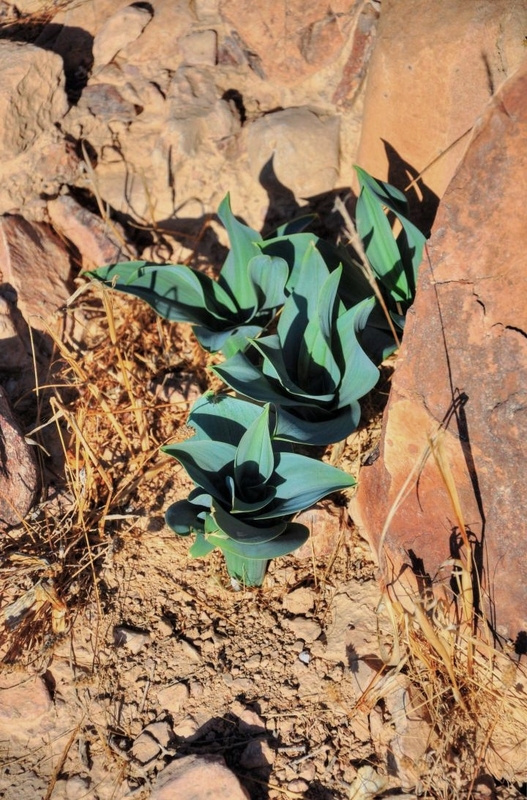 There are, though, some flowers that manage to survive the climate, and burst new leaves into a hopefully better winter. 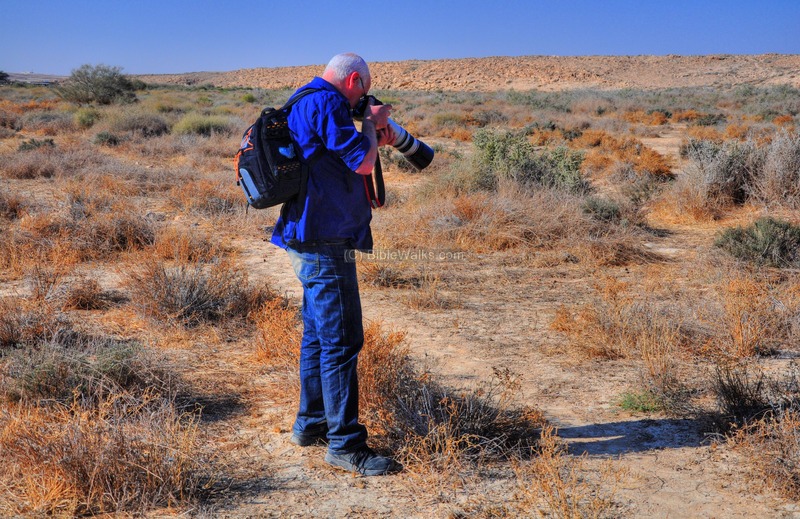 In the photo below - Yechiel is taking close up pictures. There are numerous Biblical verses naming a well. Numbers 21 16-17: "And from thence they went to Beer: that is the well whereof the LORD spake unto Moses, Gather the people together, and I will give them water. Then Israel sang this song, Spring up, O well; sing ye unto it:"
Be'erota'im, Be'erotayim - Hebrew: two wells. Bir Birein - Arabic name of the site (Bir=well). 'Ezuz - Hebrew: strong. It is based on the Hebrew version of the Bible (Psalms 24 8): "Who is this King of glory? The LORD strong and mighty, the LORD mighty in battle.". 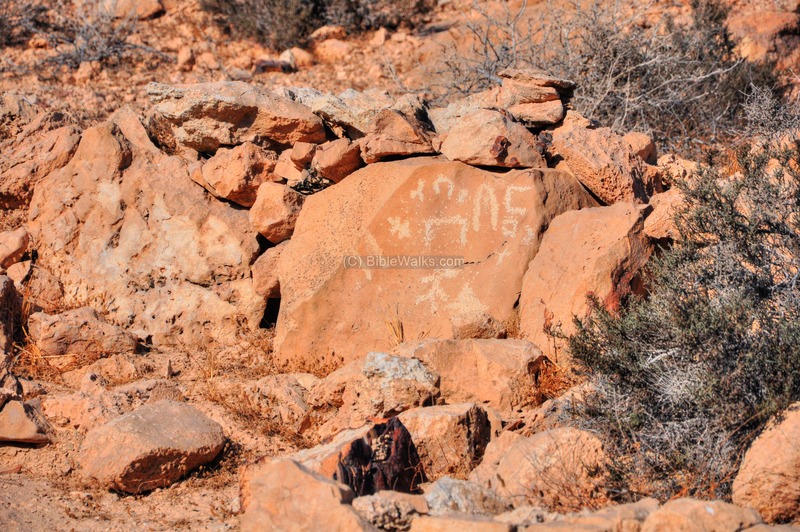 The name was translated from the Arabic name of Wadi Azizi. 'Ezuz - communal settlement in Beeorotayim. Jaakan - This may have been the Biblical name of the two wells, a site where the Israelites passed during the 40 year exodus. Deuteronomy 10:6: " And the children of Israel took their journey from Beeroth of the children of Jaakan to Mosera: there Aaron died, and there he was buried".